Gloria is the kind of woman whose story and life would be famous in a heartbeat if she spent any of her time talking about herself, which she doesn’t. 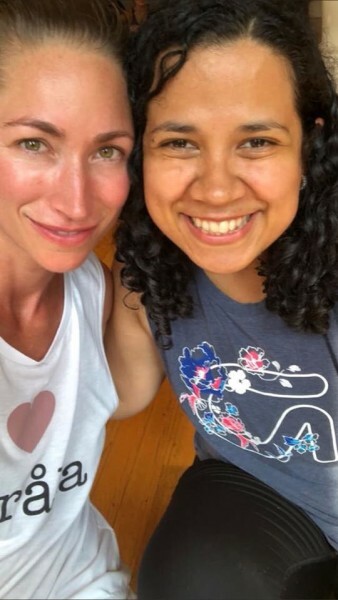 I was drawn to her since the first time she walked into our NYC studio years ago, from her kindness, and her openness to heal through ease. 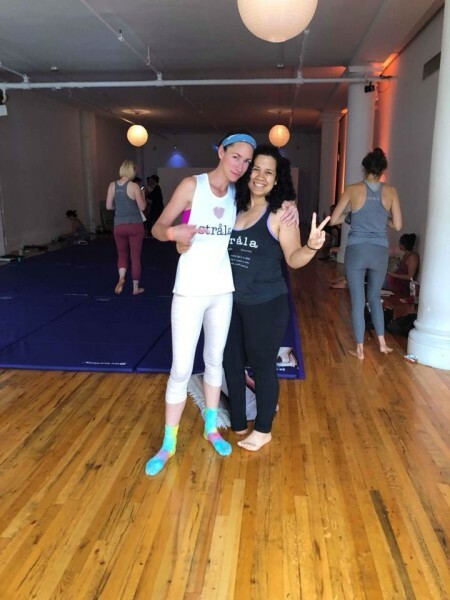 Her BS meter is high, and she came to strala on the tail of some degrading yoga class experiences, which is unfortunately what’s expected and standard in the yoga community, both historically and currently. 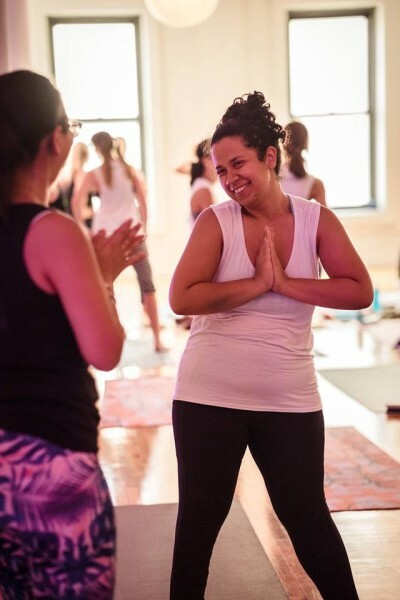 At 30, Gloria lives a vibrant life serving as an immigration attorney, and also now leads occasional yoga classes. When you first meet Gloria, it’s impossible to notice because she moves so well, that she is an amputee. She lost her foot from the ankle down at age 17 to a battle with cancer. I think it makes her even more beautiful than she is. When she moves it reminds me of a ballerina on pointe. Gloria knows her body better than anyone and can do everything she wants to do, just fine. 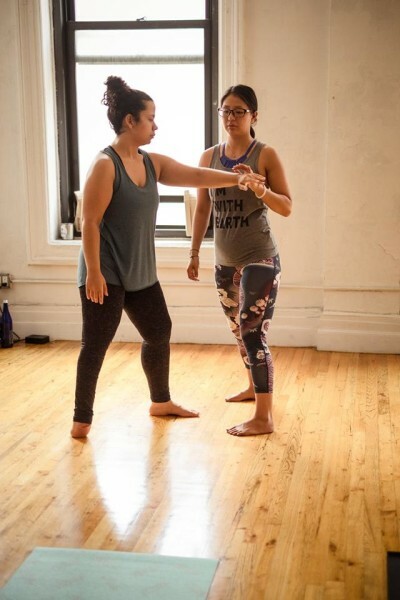 It infuriated me to hear of her yoga horror stories, of teachers bringing her truck loads of props, physically manipulating her body in attempts to “even it out” and force her into their idea of a superficially “correct” alignment. The verbal abuse she suffered, how the teacher knows more than her and how she needs to stay after class to correct her positions, enrages me. It’s a big reason I lead, and do my best to educate Guides in how to support people, rather than be forceful and abusive, masked in the mysticism of yoga. Gloria is one of the most able-bodied people I have the pleasure of knowing. My hope is her interview here gives you insight into her life and experience, and puts your bs meter back up to where it belongs. Not going along with abuse in the yoga and healing world, just because it’s unfamiliar. From the old fable, that emperor has no clothes. It’s helpful when we support each other to see the truth of things, and move from there. 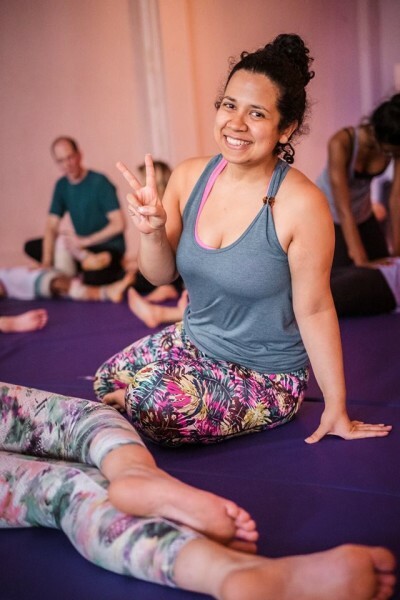 How did you first get interested in yoga and wellbeing? I hit a really low point after my first year in law school. I was having a really hard time concentrating in school, was severely overweight, had high cholesterol and my doctor told me that I was prediabetic. It was really scary! My body was begging me to pay attention to it and I had been ignoring it for years. I started going to therapy and realized that it had been five years since my battle with cancer and my amputation and I still had not given myself the space to fully heal. In the span of one year I went from being an amputee to graduating high school to going away to college. On paper, it looked like I was doing everything right, in college I double majored and double minored and was now en route to become a lawyer. But the truth was that I had given up on my body and had shifted all of my self-worth to my academic achievements. It was tough to admit, but becoming an amputee at seventeen really made me believe that I was not beautiful and that I was not worthy of love. I thought that my only value as a person lay in academic achievement and I failed to see myself holistically as being mind, body and spirit. It took a lot of work, but I had to create the space to explore my feelings. I started by writing and drawing and for the first time let myself mourn the physical loss of my foot. This allowed me to get to know who I was now. I realized through this process just how amazing my body is! This body underwent major surgery and got up on crutches the next day. It learned to walk again with a prosthetic and eventually, learned to walk again without it and how incredible is that? I was suddenly in awe of everything my body did for me and realized that I had to take care of it. That’s where my enthusiasm for wellness began. I did the first thing that I thought I had to do to have a healthy body and that was to join a gym. It made me so unhappy and I was super self conscious. My sister then suggested that I try yoga. 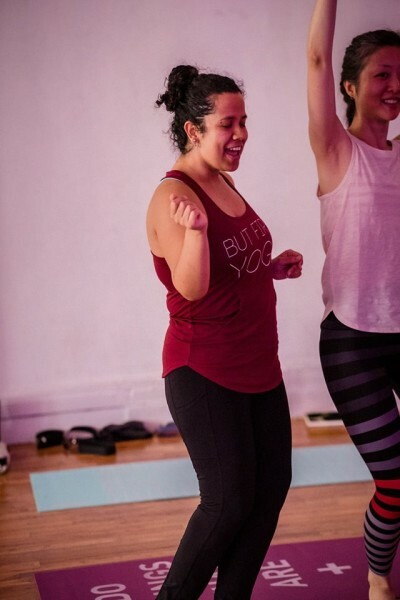 I was too scared to go to a class because I was afraid of people judging me, so my sister taught me some moves I could do at home and I watched yoga DVDs. I fell in love! Yoga helped me realize just how much movement I was truly capable of and little by little all of my feelings of limitation began to crumble. It just felt so good! I became increasingly interested in this idea of holistic health and began to incorporate nutrition, mindfulness, gratitude and meditation into my routine. Eventually, I found Strala through mindbodygreen and YouTube. I loved this idea that rather than copying a perfect form, you discover the form by moving in alignment with yourself. Then one day, I stopped at a coffee shop in SoHo and realized the studio was close to my job. It was nerve wracking, but I somehow managed to break through that last bit of insecurity and fear of judgement and I showed up to an actual class. And here we are four years later! You recently did the Strala Advanced Leadership Training. How was that and has it changed your ideas of guiding / leading when it comes to your career as a lawyer and anything with leading yoga specifically? The training was amazing! I have never felt so connected to myself and it really drove this idea home that how I feel about myself is the experience that I give others. It definitely changed my ideas of guiding and how to be a leader when it comes to my career. I think more than anything it really made me excited about creating space and sharing. Almost as soon as I came back to work I asked for permission to lead a training in an area of law that I have some expertise on. My colleagues were often coming to me for guidance on it, so I thought why not create space for this to happen? I wanted it to be awesome so I asked a super family court attorney in my practice to review my materials and asked a brilliant social worker to conduct part of the training alongside me. Of course things went wrong. Technology failed and there was no AC so we had to use very loud fans and it took some time to get the powerpoint going. Still, the whole thing was quite magical. I was sensitized and present and aware that what I was truly giving to my colleagues was the connection I had with myself in relation to the material. I wasn’t teaching them, but providing them with structure so that they could practice in their own individual ways. I was honestly so happy to be guiding in this way. The feedback I got was pretty great too. 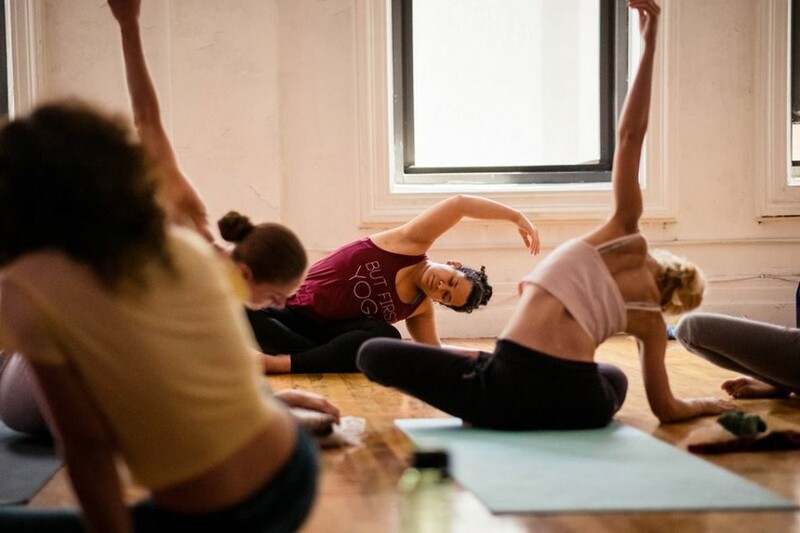 As far as leading yoga, the truly remarkable thing is that the principles are the same whether you are leading movement or a training on the law. It’s about creating space and enjoying that non-competitive connection with each other that teaches you about yourself. And it’s also about feeling good along the way. Can you share with us a bit about you surviving cancer and thriving with MS. I know it’s a part of who you are, and when you are with us in the studio, you are so graceful and radiant. You are truly incredible. Thank you! I talked quite a bit about the cancer earlier. Haha. 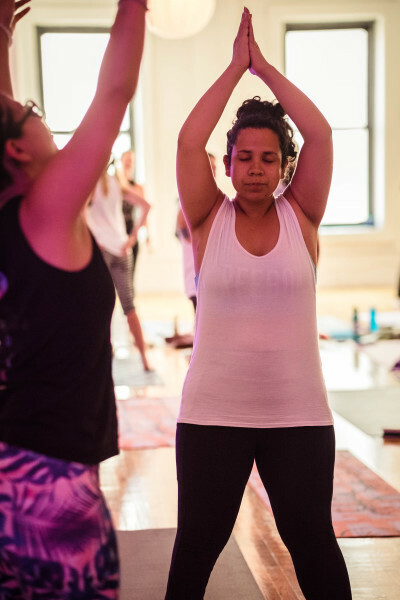 My cancer story is just so intrinsically connected to my interest in wellbeing and yoga. I will add that in hindsight surviving cancer and becoming an amputee provided me with this unique opportunity to have a lot of firsts again. First time walking, first time on the mat, first time ice skating, the list is endless and there are so many more to come! Every single experience is exciting and feels like a success. Cancer gave me an appreciation for life and the people who are in mine. Both the ones that were there before and the friends I have made after. It’s quite amazing actually. The MS, I’m not going to lie, was quite a blow. It was diagnosed the year I was celebrating 10 years cancer free and on my sister’s birthday. I had been experiencing difficulty walking, talking and coordinating movement, I couldn’t type or write. Suddenly my range of motion was compromised in a big way for the second time in my life. I had to take time to find my new baseline and to get to know what I lovingly call Gloria 3.0. The thing is, we are all constantly changing and evolving and adapting, but illness just makes it so much more evident. It’s all about perspective. Approached from a place of love, illness is an opportunity that allows you to slow down and connect to yourself all over again. Thriving with MS really is just about constantly sensitizing, checking in with your body and giving it extra love on the hard days which allows you to enjoy the good days all the more. Can you share with us what happens in a typical Gloria day? Sure thing! I like slow mornings so I usually wake up around 6:00 am and after I have fed my cat, Lupita, I drink a glass of water with lemon or apple cider and give myself 30 minutes for gentle movement and meditation. After showering, I get dressed for the workday. Lately, I’ve taken a liking to yoga dress pants that not only look professional but you can really move in. It makes it easier to breathe or stretch or move into a random warrior if you need it during the day. Around 7:00 am I usually make myself the Green Dream smoothie from Make Your Own Rules Diet or a variation. Some days I like to add random fruits or vegetables and see what happens. I like to sit down and watch the sky while I drink. I am strangely fascinated by the dome that we live under and the very many different colors it wears. Around 8:30 am I head to work. Normally I read during my commute. Right now I am reading “Sapiens: a brief history of humankind.” It was recommended by one of my #stralasummer18 buddies and it’s so good! I’m normally at work around 9:30 and usually running between the office and criminal court in the morning to intake clients and advice them on the immigration consequences of their criminal case. Lunch is the time that I get to connect with friends at work. It provides a nice break from hectic mornings and it is a really nice chance to catch up. Lunch is usually something I have cooked which more often than not is roasted vegetables and some kind of protein or an easy to put together salad. My afternoons consist of client meetings, answering emails and drafting. I try to always pay attention to how I am feeling and often do some gentle stretches in my cube whenever I’ve been sitting for too long. A little shaking and shimmying and some sun salutations are quite a nice break. If I feel like I really need to step away from my desk then I will go for a walk and search out nature. After work, if I have energy, I make my way to yoga, the gym, therapy or a friend date. It is so easy to get caught up with work and that can easily lead to being out of balance. For me, making connections with people outside of work on a daily basis helps me come back to my center and stay open. Dinner happens somewhere along the way, either with a friend or as soon as I get home. Then it’s all about unwinding. I play with my cat, Lupita, dance and sing around the apartment and do some yoga. 9:00 pm it’s goodbye tech and hello bath relaxation followed by PJs, cat cuddles and reading, sometimes even doodling or coloring. I am in bed by 10pm. Sleep is crucial for everyone, but especially when you have MS. I feel that I am always my best self in the morning when I’ve gotten at least 8 hours of sleep. What are your plans for yourself in the next 5 and 10 years? I would love to have more of a leadership role in my career, hopefully in a supervisory capacity. I’d like to be able to create space for younger attorneys to connect with experiences and grow. I also loved guiding my first Strala class, so I think more guiding is in my future! I’ve been playing with this idea of creating a space for young professionals with MS to connect and have support. Not sure what that will look like yet. Maybe a blog? 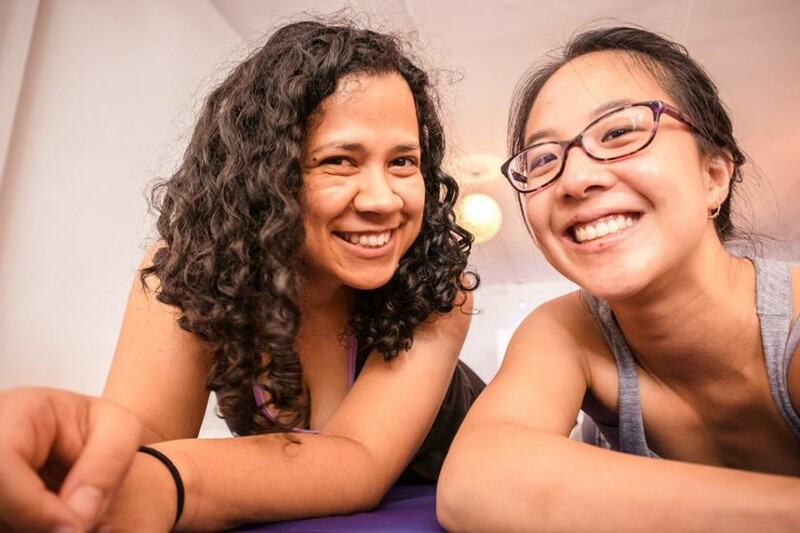 Yoga classes for people with MS that do not conflict with their work day? I’m excited to open this door and see where it leads! Any secret practices for the happiness you embody? It’s definitely not a secret, but I always go back to gratitude. If it’s been a hard day, I start with gratitude for the smallest of things, like my breath, weekends, sleep, the sky, my remaining toes, anything is fair game! The form is always shifting, sometimes I journal, sometimes I call someone to tell them I love them, sometimes it’s a shout-out on social media, but more often than not, I like to pick simple moments for gratitude. I like to think of something I’m grateful for before I get out of bed, something simple, absolutely no pressure on myself. I have also set an intention that whenever I walk out of the subway and onto the street, I will think of something else to be grateful for, more often than not it ends up being the sky (I know, but seriously it’s so gorgeous!). And then at night when I’m taking a bath or when I’m back in bed I go through my day and find small things that mean a lot, like did I speak with my mom or sister? Did I get to see a friend? Did something great happen, or even if it didn’t, isn’t it nice to be home? I could go on forever. But gratitude is really where it’s at for me. Any favorite recipes that are easy enough for us to make, are healthy and delicious also? Sorry that’s a tall order. I am completely obsessed with this autoimmune cauliflower salad! It’s the dish I bring to parties and celebrations, but it’s so delicious and so easy to make that I often make it just for myself. Whisk together with all of the other ingredients. Cover bowl and refrigerate overnight. Yes, I know you have to wait until the next day to eat it, but I promise it’s totally yummy and worth it!